Derek, Iza & Shaina give the election season a romantic twist in My Candidate directed by Quark Henares under Quantum Films, MJM Productions, Tuko Film Production and Butchi Boy Films. Showbiz hunk Derek Ramsay, Iza Calzado and Shaina Magdayao give us a different tale of love and romance this election season via My Candidate from Quantum Films, MJM Productions, Tuko Film Productions at Butchi Boy Films, producers of the award-winning and critically-acclaimed romantic-comedy films, English Only, Please and #Walang Forever. The film is set against a political background and so, it is timely as today's headlines. It will shown in theaters nationwide beginning May 11, 2016. Derek plays Congressman Sonny Suarez, now seeking a Senate seat. He may be a perfect candidate but is painfully shy and a bit withdrawn. Iza, meanwhile, is Vera Sanchez, Sonny's erstwhile girlfriend and arch rival in his senatorial bid. She possesses strengths lacking in Sonny. She's charming as well as engaging but is not able to relate to people from the grassroots. Shaina is Billie Pono, a life coach and communications trainer. Sonny's campaign team hires her services to help polish their candidate's public speaking skill and innate charisma. Billie succeeds at turning Sonny into the dream candidate and the two become close while at work. In turn, Sonny is able to unleash some unresolved issues in Billie's life, including her insecurities thereby making her a better version of herself. Netizens swore by Derek, Iza and Shaina's outstanding performances. Shaina held her own against Iza in the film, and this may be considered as her biggest break as a lead actress. Shaina definitely gave the role her all, especially in scenes where her character finds herself slowly falling in love with Sonny. Take note, Derek and Shaina also register very strong positive vibes on screen. Their romantic scenes together are neither hard sell nor put on, so, their pairing is indeed one of today's freshest, newest romantic-comedy tandem. No wonder, Direk Quark Henares is satisfied with his three main stars plus the support cast composed of Al Tantay, Nico Antonio, Ketchup Eusebio, Ricci Chan, Jun Sabayton and Tirso Cruz III in a special role. Also part of the movie is box-office director Dan Villegas, who serves as Creative Producer. Direk Dan is the genius behind such award-winning and blockbuster films as English Only, Please and #WalangForever. His latest hit project is Always Be My Maybe. Fresh concept. Hilarious story telling. New screen combination. 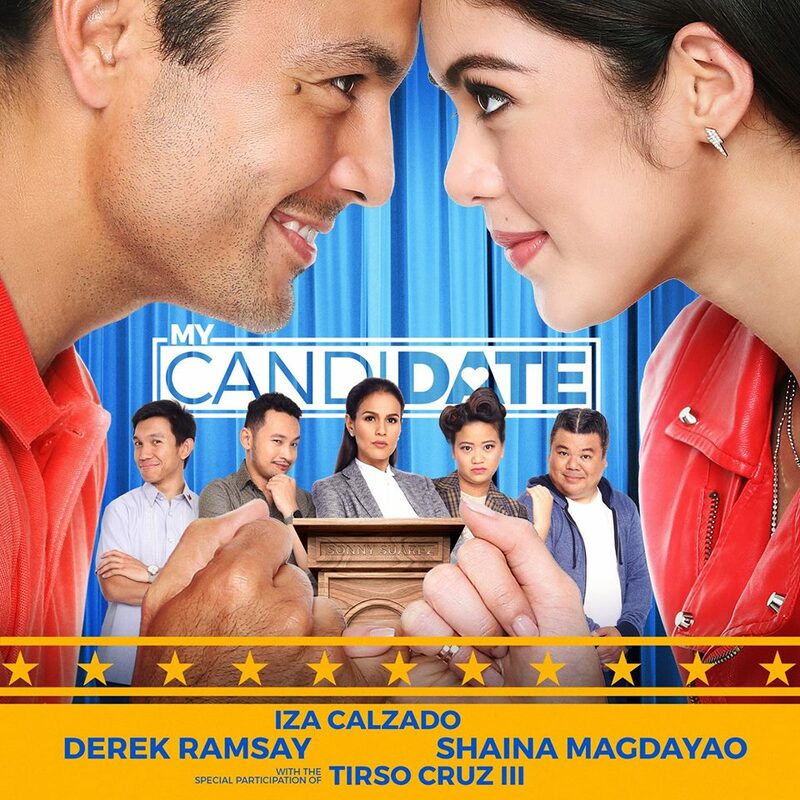 My Candidate gives the election season a romantic twist starting May 11 in theaters nationwide.